Just as the title say, Greenlee has some T-Slot hole saws with an adjustable depth stop. The stop will help in situations were you could come into contact with wires or plumbing behind the cutting surface. The stop will not only protect the wires and plumbing, but can also protect you from serious injury. The stop will work with all Greenlee T-Slot hole saws, ranging in size from 7/8" to 6". The stops can also be removed and transferred between hole saws, allowing you to use up to 4 stops on one saw. 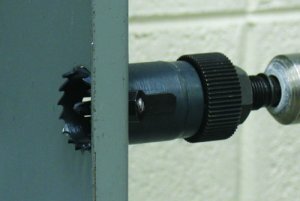 The stops are included with some popular hole saw sizes, and can also be purchased separately.